With these recent changes, however, I'm unable to hide any longer behind the peculiarities of Blogger.com's display settings. It's with this in mind that I will implore the reader, if at all possible, to ignore the name attached to this piece, and to attempt what bloviating literary theorists might refer to as a "New Critical" approach to this and all the future posts I submit. developed in the 1920s-30s and peaked in the 1940s-50s. The movement is named after John Crowe Ransom's 1941 book The New Criticism. New Critics treat a work of literature as if it were self-contained. They do not consider the reader's response, author's intention, or historical and cultural contexts. New Critics perform a close reading of the text, and believe the structure and meaning of the text should not be examined separately... The New Criticism has sometimes been called an objective approach to literature. In short, New Criticism represented an attempt by Ransom et al. to look at only the text itself, and not to view it within the context of, or as symptomatic of, something else (i.e. its author, a culture, a time period, etc). Lest the reader begin to think that the present work is dedicated entirely to the history of literary theory, allow my to suprise you by saying that this won't be the case at all. Rather, this discussion of the New Critics is actually something that might help us understand certain biases football fans and writers might exhibit. For it was this past week, while reading Brian's contribution to the Times, that I was struck by a brief comment he made -- a comment which I believe reveals the degree to which context (or narrative or whatever the New Critics were trying to avoid) can alter our perception of a team. The way to stop the Steelers’ offense is to take away the deep pass. In fact, the more the Jets’ defense can force them away from passing at any depth and toward running on first and second downs, the better. Despite their reputation as a “run-first” team, the Steelers are actually a mediocre running team with a 38 percent SR, ranking 27th in the league. The notable thing here is that the 2011 iteration of the Pittsburgh Steelers could have a reputation as a run-first team in the first place. As Burke notes, they have one of the league's worst success rates on the run. As Burke notes again, quarterback Ben Roethlisberger actually leads the league in deep-pass percentage. As a team, the Steelers have passed the ball on 56% -- that is, exactly league average -- of all plays during "normal" football (i.e. 1st and 3rd quarters, within 10 points either way of their opponents). Offensively, in other words, the Steelers are way less about imposing their collective will on opposing defenses and way more about relying on a talented quarterback, two or three fleet-footed receivers, aggressive play-calling, and the whims of chance. Yet, this is clearly not the story that is told about this, or any other, edition of the Steelers. Certainly, since the start of the Chuck Noll era in 1969, the prevailing identity of the team has been decidedly smashmouth-y. The legendary Steel Curtain defense, the bus-shaped Jerome Bettis, the very angry-seeming James Harrison: each has served only to strengthen the reputation of the Steelers as hard-nosed group in control of its own fate. Nor is the characterization of the current Steelers as an uber-physical team necessarily wrong. Certainly, their defense -- led by three of the league's four best linebackers (as measured by +WPA) -- continues to be genuinely frightening. Yet, a brief search of the interweb finds recent articles from the Providence Journal and Seattle PI that reference the team's "run-first" approach -- this, even as Roethlisberger himself attests to the relative importance of the pass to Pittsburgh's offensive success. So, we ask the question: why does this notion of the Steelers as a rushing team persist? One possible explanation is that, for many fans and writers, it's difficult to imagine an excellent and very physical defense coexisting with anything but a run-first offense -- and certainly not with an offense so comfortable with risk as the Steelers. Another possible one explanation is that fans and media generally don't take a New Critical approach to football. Just as the reader prepares himself for sadness and confusion when he sees the name "Carson Cistulli" appended to an article, he's just as likely, when he sees the words "Pittsburgh Steelers," to conjure up images of terrible towels and ball-control offenses. These images are helpful for constructing narratives. The thing about narratives, though, is that, while frequently pleasant, they're also sometimes misleading. In fact, even for those who understand the importance of Roethlisberger's quarterbacking abilities to the Steelers, there's still a tendency to underrate his skills relative to other excellent QBs. "(Ben) may not be Brady or all those other guys, but when I see him in the huddle I know we've got a chance to win," receiver Hines Ward said. "He's a proven winner." Jets cornerback Antonio Cromartie seems to agree. A week after calling Brady an expletive, [Antonio] Cromartie had nothing but praise for Roethlisberger, who's 9-2 in the postseason. "I love Ben, man," said Cromartie. "Ben's a competitor." [Coach Rex] Ryan says facing the 6-foot-5, 241-pound Roethlisberger is hardly the same as preparing for Manning or Brady, the latter of whom the Jets sacked five times Sunday. "(Manning and Brady) approach things a little different," said Ryan, who lost the 2009 AFC title game in Pittsburgh as Baltimore's defensive coordinator. "Roethlisberger will beat you up. ... I've never seen a guy take the hits he can take and also make people miss the way he does and be as accurate on the run." While there might be qualitative differences between the way Roethlisberger and Brady and Manning play, it'd be hard to say, at this point, that they produce significantly different results. The triumvirate finished second, first, and seventh, respectively, by EPA/G -- and fourth, third, and ninth, respectively, in terms of net yards per pass attempt. Furthermore, with regard to Ryan's point about Roethlisberger's pocket antics, that might be the case, qualitatively; however, again, the results don't necessarily bear that out: Manning (2.3% sack percentage) and Brady (4.8%) were sacked far less often than Roethlisberger (7.6%). Obviously, one of the interests of ANS -- of all quantitative analysis of sport -- is to identify and explore those areas where perception and reality differ. Certainly, we see -- in the cases of pass-run mixes and fourth-down management, for example -- we see areas where inefficiencies exist in on-field strategies. The gaps between perception and reality in team-related narratives don't necessarily relate to the field of play. But they certainly inform our understanding and appreciation of the game. My favourite line of this week's reading came in TMQs column, when he said "Almost all quarterbacks play less well after they've been hit hard several times in the pocket -- the main exception is Ben Roethlisberger, whom the Jets face next, who doesn't even seem to be aware he's being hit, much less care". Ian - He certainly IS a physical specimen. That play he had -- what, about a month ago now? -- where he escaped Terrell Suggs and threw the ball out of bounds was crazy. 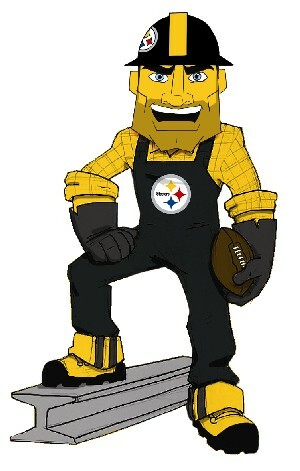 Steely McBeam looks like a nighmarish clown version of Cowher that should have been named Jaundice McJaw. Just sayin'. The perception of the Steelers being smash-mouth is the time of possession and the running done in the second half. This of course is past history where as current history does indeed show the Steelers can't run. It is Ben that forces defenses to change their tactics and give a illusion of a running Steeler team. Sacks and the percentage sacked alone does not give any meaning. These are only numbers. What I have not yet seen are stats about defenses and how they prepare for Ben. Success is not always shown in numbers. I know this wasn't your main point, but on BR's "pocket antics": don't we have to look deeper than sack percentage? Roethlisberger, Manning and Brady have different sack percentages, but they also have different offensive lines. To know whether Roethlisberger is better than, say, Brady at evading pressure, we would need to give Brady the Steeler offensive line or Roethlisberger the Patriot offensive line, _then_ compare sack percentage. It could be that Brady, in BR's situation, would have a sack percentage that was much worse. But really, who cares about sack percentage? Roethlisberger plays a different style than Manning or Brady, frequently eschewing precise timing routes and purposely waiting until the defense breaks down. This may lead to more sacks, but if it also leads to more big plays, then it could be on net just as effective a strategy -- and Ben's ability to evade pressure would be a critical part of that effective strategy. I really think this is a case where the common narrative is correct: Ben Roethlisberger keeps plays alive longer than almost any quarterback in the league can, which is a rare and valuable skill. I'd agree with that. His receivers have all day to find holes, and I'd suspect that's one reason the Steelers can be so successful with deep passes.